Has Ford made a big mistake not bringing it to the US? After much waiting and more than a few spy shots of uncamouflaged test cars, Ford has finally officially unveiled the latest Focus ST. 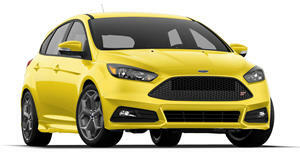 It now comes packed with a new-generation 2.3-liter EcoBoost motor which produces 276 horsepower and 309 lb-ft of torque. The old 2.0-liter lump made 247 hp and 250 lb-ft as a comparison. It also comes with some cool new features like anti-lag technology originally developed for the Ford GT and F-150 Raptor, a low-inertia twin-scroll turbo and electronically actuated wastegate. This all translates into a 0-62 mph time of under six seconds which is an impressive time for a FWD hot hatch and just about on par with the mental Civic Type R.
It's not all about straight-line figures either, the new ST is packed with acronym-laden tech to help it conquer corners too. A new eLSD electronic differential is claimed to be able to direct up to 100 percent of power to the wheel that has traction while also reacting quicker than a traditional mechanical LSD. A super-quick steering rack, electric brake booster and continuously controlled damping (CCD) all contribute to a sharper driving experience. US customers, however, will not be exhilarated by any of these new technologies, seeing as Ford is adamant that no new Focus models will be coming to our shores. We may get to see that new EcoBoost motor in the updated Mustang based on an NHTSA filing a few days ago. The all-new Focus ST will go on sale in Europe this summer.